Waking up in a stranger's bed, Henrietta Markham encounters the most darkly sensual man she has ever met. The last thing she remembers is being attacked by a housebreaker-yet being rescued by the notorious Earl of Pentland feels much more dangerous! Since the cataclysmic failure of his marriage, ice has flowed in Rafe St. Alban's veins. But meeting impetuous, all-too-distracting governess Henrietta heats his blood to the boiling point. 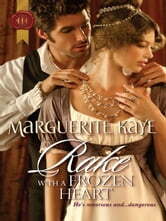 When she's accused of theft, Rafe finds himself offering to clear her name. Can Henrietta's innocence bring this hardened rake to his knees?